American Mystery Classics, 9781613161180, 240pp. Mr. and Mrs. North live as quiet a life as a couple can amidst the bustle of New York City. For Jerry, a publisher, and Pamela, a homemaker, the only threat to their domestic equilibrium comes in the form of Mrs. North's relentless efforts as an amateur sleuth, which repeatedly find the duo investigating murders and sundry other crimes. So when the wealthy backer of a play is found dead in the seats of the West 45th Street Theatre, the Norths aren't far behind, led by Pam's customary flair for murders that turn eccentric and, yes, humorous. Alongside Lieutenant William Weigand of the New York Police Department, they'll employ illogical logic and bizarrely tangential suggestions to draw the curtains on a killer. 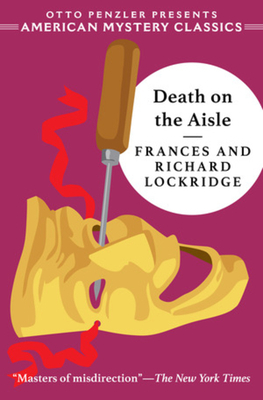 A light mystery set in a classic Broadway locale, Death on the Aisle is lent verisimilitude by author Richard Lockridge's career as a theater critic. Though it is the fourth novel in the saga of this charming, witty couple, the series can be enjoyed in any order, with each installment depicting its own self-contained story.